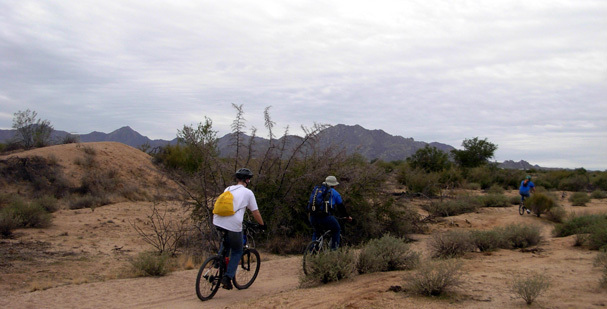 "Maricopa County is proud to be home of the largest regional park system in the United States. 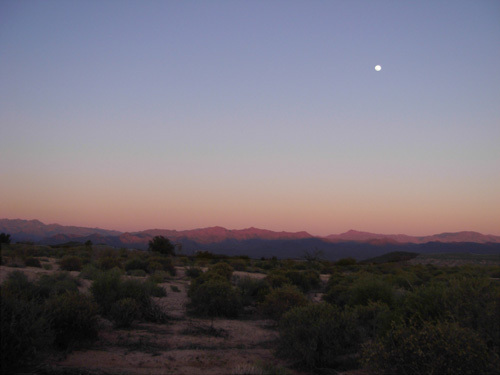 on a guided hike, or spend the night at a campsite under the starlit Arizona sky." The folks in Maricopa County, Arizona showed considerable foresight in the mid-1950s when they set aside approximately 120,000 acres of land in ten regional parks that ring the metro Phoenix area. Each park is unique in regards to its history, geology, vegetation, wildlife, and recreational opportunities. Some of the parks are primarily desert, while others have wetlands, lakes, or streams. Many are mountainous. The goal of the parks and rec department is to "provide recreational and educational opportunities while protecting park resources . . . for a safe and meaningful outdoor experience." There are guided hikes to examine the flora, learn about native wildlife, explore ruins of the Hohokam Indians who inhabited the area until 1450 A.D., interpret petroglyphs chipped into rocks, or hike under the full moon. Activities available in some or all of the parks are hiking, running, and riding trails on foot, bicycles, or horses; camping in tents or RVs in developed and/or primitive campgrounds; golfing; picnicking; birding; photography; fishing and boating; archery; volleyball; shooting range. 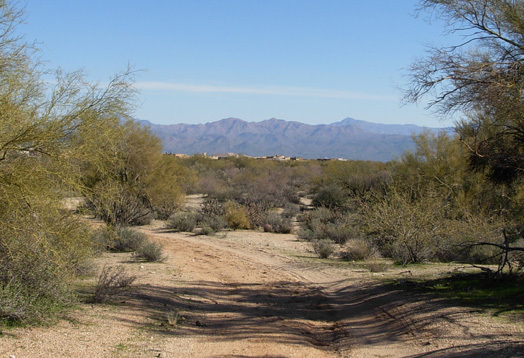 Estrella Mountain was the first regional park to be developed. We will probably stay there when we run Across the Years the next time because it is fairly close to Nardini Manor on the southwest side of Phoenix. Unfortunately, we didn't take the time to visit it while we were on that side of town a few weeks ago and we didn't want to drive back after moving two hours east. We now know that it has campsites suitable for our rig. We drove through Usery Mountain Regional Park on January 9 when we did a large loop on the eastern side of the metro area. As the crow flies it is only about fifteen miles from McDowell Mountain Park. It's considerably longer to drive to it, however. Entrance fees are required in each park; our sticker for McDowell got us into Usery without another fee. We drove through the campground at Usery but didn't check out any of the trails there. Campgrounds in the park system have a two-week limit when they are busy. Fortunately, we have had no problem staying here at McDowell for almost three weeks even though it is more full this weekend (January 18-20) than it was earlier in the month because of a mountain bike race in the park If we had to move, we would've tried Usery next since it is closest. The largest park in the system is McDowell.Mountain Regional Park, where we are camping. It has over 21,000 acres and about fifty miles of trails and dirt roads to run and hike or ride bikes or horses. Since we stayed here for about a week in February, 2004 for the Pemberton 50K race, we knew how nice the campground and trails are and we wanted to come back. It's been great! 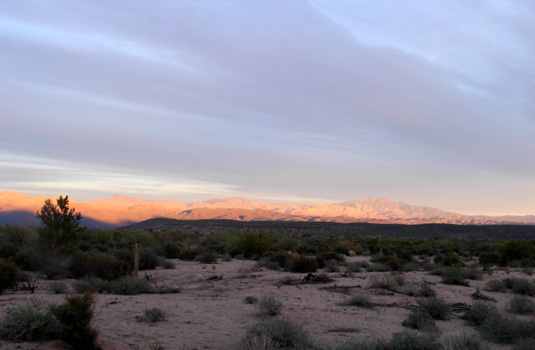 Both of those photos are from our campsite, looking southeast toward the Goldfield and Superstition Mountain ranges. This park in the lower Verde River basin is surrounded by mountains. Elevations at the low end of the park are about 1,800 feet and rise to about 3,000 feet at the high end, affording some wonderful panoramic views. The stars on clear nights are as mesmerizing as the kaleidoscope of colors on the mountains at dawn and dusk. Too bad we'll be leaving a couple days before the ranger-guided Full Moon Hike next week. We've walked around the campground loops at night to enjoy the star show but it'd be more educational with a ranger reminding us which constellation is which!. Although there is historical evidence of pictographs and petroglyphs in the Red Rocks area north of Phoenix from the ancient Paleo period (11,000 to 9,000 B.C. ), there is much more evidence in the McDowell Mountain Park area from less ancient ancient inhabitants: nomadic big-game hunters, Hohokam Indians, and Mexican immigrants who lived here from about 2,000 years ago to 1450 A.D. 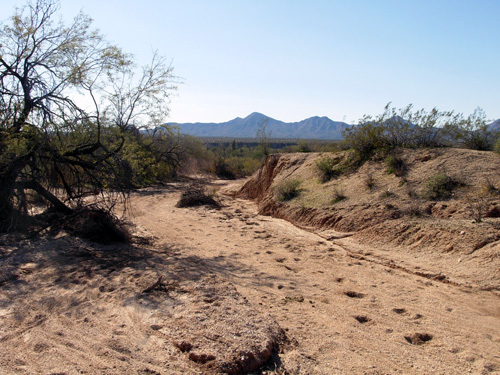 The availability of water has always been an issue in the Sonoran Desert. Two rivers converge east of Phoenix proper, very close to the McDowell Mountains -- the Salt and the Verde. The Hohokam people left a lasting legacy by figuring out a way to tame the arid valley: they built a maze of irrigation ditches for intensive farming and drinking water. 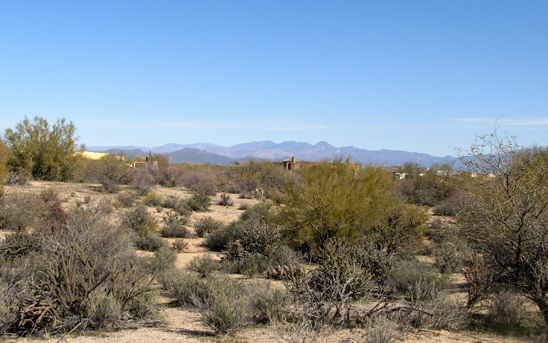 It is estimated that between 4,000 and 10,000 Hohokam Indians lived in the area surrounding McDowell Mountain Park at the peak of their culture. The remains of several hunting and gathering sites are still visible within park boundaries. Then the Hohokam mysteriously disappeared around 1450 A.D. That was about fifty years before the Spanish arrived in the area under the leadership of Coronado. Later other Native American tribes settled here: the Mojave, Apache, and Yavapai..
Now jump to the mid-1800s when the land that is now McDowell Park was part of the rugged, sparsely populated Arizona Territory. White settlers and military troops to protect them began arriving in the Phoenix area, although the town wasn't named "Phoenix" until the 1860s. Someone suggested the name because a new city was being built on the remains of the vanished civilization of the Hohokam people, reminiscent of the mythical bird that rose from its own ashes. Fort McDowell AKA Camp Verde (after the Verde River) was established just east of the current McDowell Mountain Park property in 1865 and was manned until 1891. Pioneer John Smith established a hay-growing operation on a nearby Hohokam site and supplied forage to the outpost. Just a bit more history. Remember when I mentioned the term "wash" in the last entry? Here's the story behind one of the washes in McDowell Park. 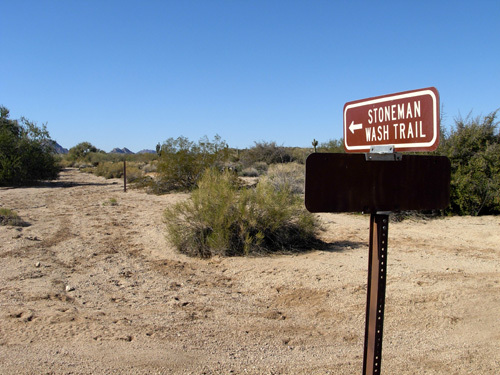 Stoneman Wash cuts a diagonal through the park and is listed on the map as a trail. We didn't find it to be a good running surface, however, nor would you want to ride a bike there. It's just not packed down firmly enough to get decent traction, at least when we were there. Even after the rain it was very loose and soft. 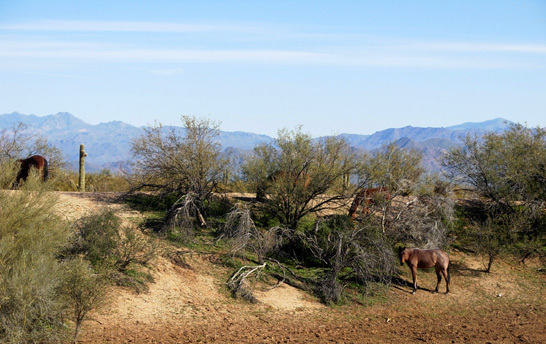 It's better suited to the equestrians who also share most of the trails at McDowell Park. Pemberton Trail at the intersection with Stoneman Wash also looks like a wash. According to a military history brochure we picked up in the visitor's center, when early pioneers and military troops arrived in the area in the mid-1800s they had to follow rudimentary roads and trails made by the Native Americans that had lived here for centuries. It would take some time to build roads that were suitable for wagons to travel. Colonel George Stoneman was appointed as the first military commander of the Arizona Territory in 1870. Soon after his arrival he ordered a strategic military road built along the Indian trails near Stoneman Wash to provide a direct route between Fort McDowell and Fort Whipple, near Prescott. The road became known as the Stoneman Route. More than 7� miles of the old route are currently within the boundaries of the park. Fort McDowell and nearly 30,000 acres of land next to it were deeded to the Mojave-Apache-Yavapai Indian Tribe in 1902. The tribal lands are now called the Fort McDowell Indian Reservation or the Yavapai Nation. We drove through the reservation a couple times to get back to our campsite after doing laundry at a private campground near the tribe's casino on State Route 87. Most of the tribal land is used for grazing, farming, and orchards. Limited view of the town of Rio Verde from the Pemberton Trail going clockwise. If I hadn't been walking up a hill I wouldn't have even noticed them. 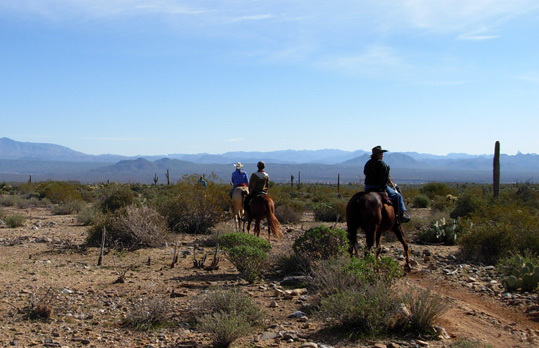 The northern and far northwestern portion of the Pemberton Trail also borders some ranches. At one point the trail follows fencing near Granite Tank, which you run along in both the Pemberton 50K and Javelina Jundred races. I didn't see any critters grazing there this trip, though. 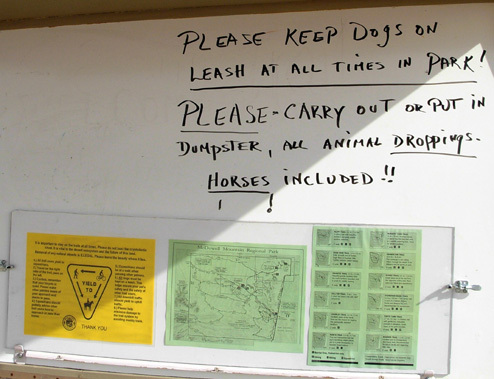 Horses often wander into the park to graze from an adjacent ranch near Cedar Tanks and a spur trail that sort of connects to 158th Street (which is a dirt road in a very rural area, not in a city like it sounds). I'll show photos of the horses I saw at Cedar Tank below and in another entry. 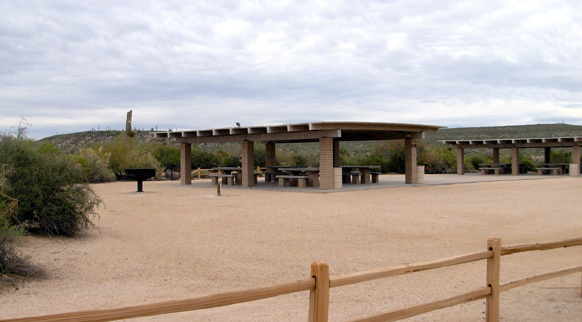 We really appreciate the wilderness feel of all the trails in McDowell Park, although from the higher points you can see signs of civilization like the park campground (good for getting our bearings) and the fountain in Fountain Hills. I love the panoramic views of all this gorgeous park land -- about 21,000 acres of it -- and beyond. I mentioned Cedar Tank and Granite Tank above. What the heck is a "tank?" you may ask . . . The closest definition I could find in my handy-dandy American Heritage dictionary is a "pond." The Maricopa County Park system brochure describes a "depression" scoured out by infrequent heavy rains and runoff. One of the ten parks is at White Tank Mountain, named for its numerous tanks in the white granite canyons. McDowell Park has at least three areas named Tank (the third one is Tonto Tank, near the bench honoring Geri Kilgariff). I saw water in only Granite Tank. It appeared to be used by livestock. The picnic area is fenced to keep horses, bikes, and other vehicles out. A caretaker lives at this location in a large RV (in an area to the right of the photo above). There is a large parking area, restrooms, hitching posts for horses, and room for overflow RV parking when both campgrounds get full. Next entry: lots more scenic photos of McDowell Park's trails that I took on various runs and hikes. I never could get Jim to carry a camera . . .